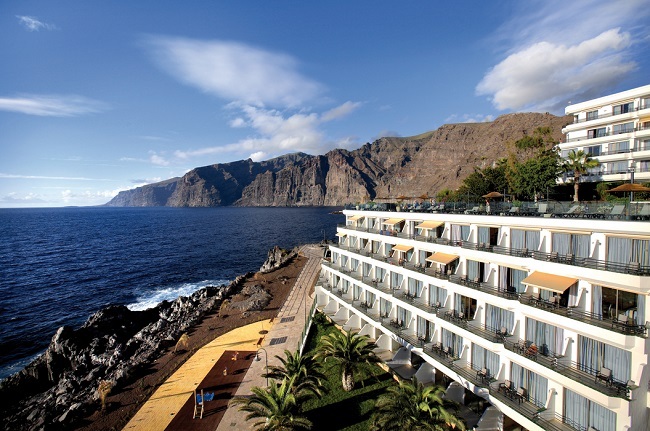 Situated in one of the most beautiful natural settings in the south west Tenerife, commanding impressive views of La Gomera island and Los Gigantes cliffs. This attractive hotel, with its unique architecture and recently refurbished, sea views and direct access to a beach just 200 metres away, offers a wide range of amenities to ensure a pleasant stay for all our guests. Situated approximately 45 kilometres from the South Tenerife Airport. Buffet Restaurant serving international cuisine with show cooking and a large terrace, commanding views of La Gomera Island (with smoking section). Selection of tapas and savoury snacks, Spanish wines, gastronomy corner, live music performances and smoking section. 19:00 - 01:00. Selection of set course dishes and snacks, cookery demonstrations, music and views of Los Gigantes cliffs and La Gomera Island. 10:00 - 18:00. Bar Teatro: Entertainment shows at 21:30. Restaurant, Bar, 24-Hour Front Desk, Terrace, Non-Smoking Rooms, Elevator, Safety Deposit Box, Heating, Luggage Storage, Shops in Hotel. Tennis Court, Fitness Centre, Games Room, Spa & Wellness Centre, Children's Playground, Billiards, Table Tennis, Darts, Jacuzzi, Hiking, Outdoor Swimming Pool. Meeting/Banquet Facilities, Laundry, Dry Cleaning, Barber/Beauty Shop, Currency Exchange, Souvenirs/Gift Shop, Car Rental, Fax/Photocopying. Private parking is possible on site (reservation is needed) and costs EUR 5.00 per day.